As I mentioned a few weeks ago, Glidden asked if I would try both of their new paint offerings at the exact time when I was on a painting kick. Kismet! I used their new Complete paint four our shore bunk beds but I needed something a little different for the mini bathroom makeover. 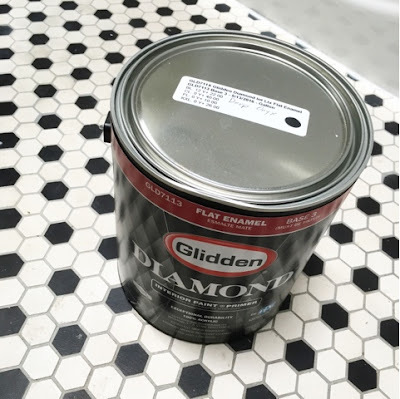 Enter Glidden Diamond - a paint and primer in one that promises to hold up to repeated washing and last longer in high traffic areas - which sounded like the perfect product for painting my bathroom black. I had been considering it for so long, this was just the impetus I needed to get it going. I went with my favorite black - Deep Onyx - in flat enamel. The coverage was good despite black being a notoriously tricky color to get uniform richness with. I barely made a dent in the gallon to paint this little space. As it was drying, it did look a little streaky which had me concerned at first but it dried to a beautifully matte and even rich black that I could not love more. The color totally transformed the look of the room. A few other accessory changes and it's barely recognizable. Obviously I had expected to like the color I picked but I really can't describe how happy this little makeover makes me everytime I pass by. Just further confirmation to go with my gut on decor decisions and not to second guess myself. Want to test this paint for yourself? Once again, the lovely people at Glidden have offered to giveaway up to 5 gallons of this new paint to one lucky winner. Simply apply below and I'll pick a winner next week. disclosure: This post was sponsored by Glidden but all opinions expressed are my own. Read my blog posts about color + paint on MyColortopia. Am I the only one that the giveaway isn't loading for? I've tried two different browsers and don't have any other issues. Hi Christina - looks like there was a glitch and it wasn't loading. All fixed now. Thanks so much for letting me know! I was also thinking of doing some black too, so it's good to hear that this stuff covers well, and it's such a pretty finish. I think of black as such a trendy color, but you make it look timeless! I have a bathroom at my house that could also use some TLC by way of paint. Looks great!  I have several rooms in our home I want to paint. I'm currently debating on colors for our dining room, so this would be great. Hey there! I would help my sister paint her bathroom. We'd have to figure out a color to complement the existing blue tiles. The black is so striking in photos, but I'm wondering how it feels in the room? Does it absorb too much of the light? Did you compensate with brighter bulbs? I love the black - looks amazing! I would finally repaint the upstairs like I've been wanting to do!! Our master bedroom is in desperate need of a new paint job! Five whole gallons! I could paint both my bathrooms & my mudroom with some leftover. I love the matte finish and you make me less afraid of black! I have a bathroom, living room, dining room, girls bedroom and kitchen to paint....this would be amazing! Help my parents paint their newly reno'd space! Planning to redo the girls' room this fall to make it more big girl and make room for a built in window seat and a loft bed for each of them. This paint sounds great for a kids room! We moved into a house with all white walls. My sons room is next to be done! Thanks for the chance! 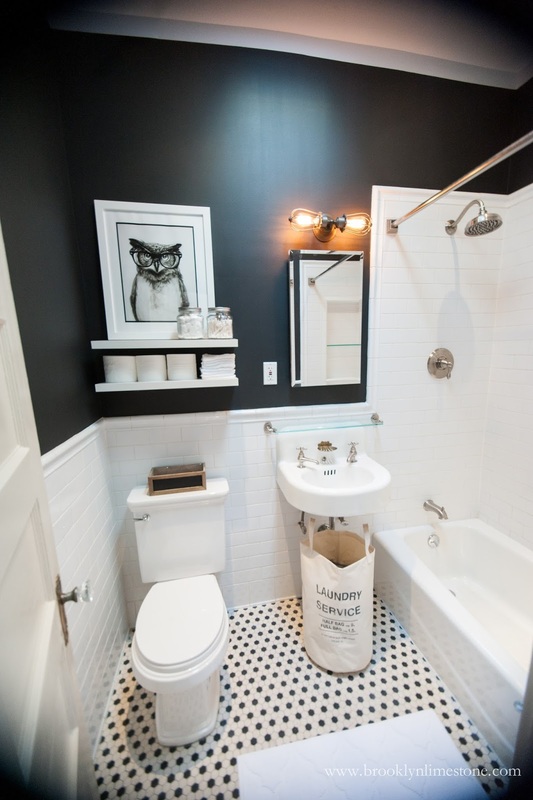 I would paint my master bedroom and bathroom a soft gray. Thank you for the opportunity to enter! I would paint my living room. Thanks for the giveaway! Looks great - classic and rich! I have a mid century rancher with original tile baths - I may have to do one like this to update. What an awesome giveaway! I would love to paint our library as well as our master bath! I would paint all the bedrooms in my house. I love the color you chose for the bathroom. Our walls are in need of a pick me up. I would paint my bathroom that is "pee" yellow! We have a spare bedroom that we are converting into a playroom for the kids, so this would be used primarily for that. 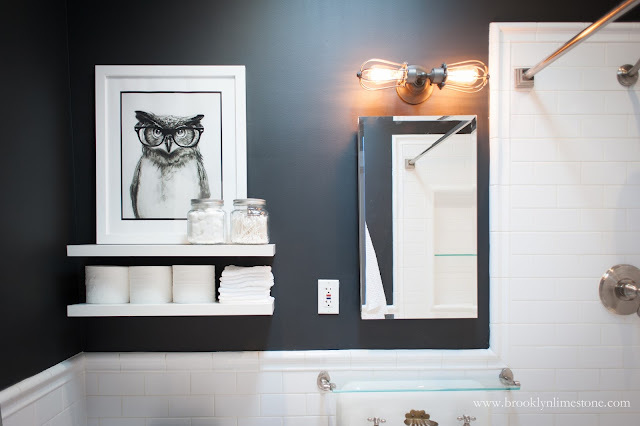 Your bathroom transformation is amazing! The bathroom looks great! If I had 5 gallons of Glidden paint, I'd repaint our bedroom, paint the hallway, and paint lots and lots of trim. I would paint two bedrooms. Paint the living room that we have been putting off for so long! We put an offer on a house- i hope we get to paint it with this! We have a breeze way we are getting ready to redo. 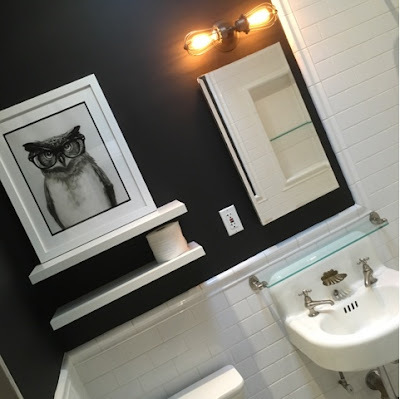 Love the black paint color with your bathroom tile!! I would paint our bonus room. It's a fun and cozy room but the builder beige is depressing! Its open and connects into a staircase and with the 10 ft ceilings (thank you builder for agreeing to bump up the ceiling... i forgive you for the beige)it would take a lot of paint! We are taking over my husband's parent's Adirondack camp and need to paint every room. This giveaway would be a tremendous help. Love the black BTW. Lovely. We just purchased our first house - a rancher that needs a lot of work in Austin, TX. Everything needs painted! The black in your bathroom is just lovely BTW. I would love to paint my living and bathroom. Thanks for this awesome giveaway!